Three parts of episode 17 deal with Christmas. First, Minamo happens upon Yukari, who is picking out favorite selections from a Christmas catalog, and berates her friend and Chiyo for their favorites. In class, Sagara and Tomo wonder if Chiyo still believes in Santa and argue about the logistics of delivering presents. Chiyo says that Santa is her father, which leads to Sasaki thinking about Chiyo’s “father” as Santa. Tomo asks Yomi what she wants for Christmas, and then teases her about her greed when Chiyo mentions a more innocent gift. Tomo later feels embarrassed, though, when she finds out that everyone but her knows that reindeer do actually exist. On Christmas Eve, the girls hang out and karaoke. The one requirement, snow, is present. Funnier elements include a drawing of a reindeer and Chiyo-Father talking about being Santa. Friendship and innocence. This episode probably won’t get you in the Christmas spirit, and it certainly contains no reflection on the true meaning of the holiday, but it will do what all episodes of the series will – make you laugh and feel joyful. 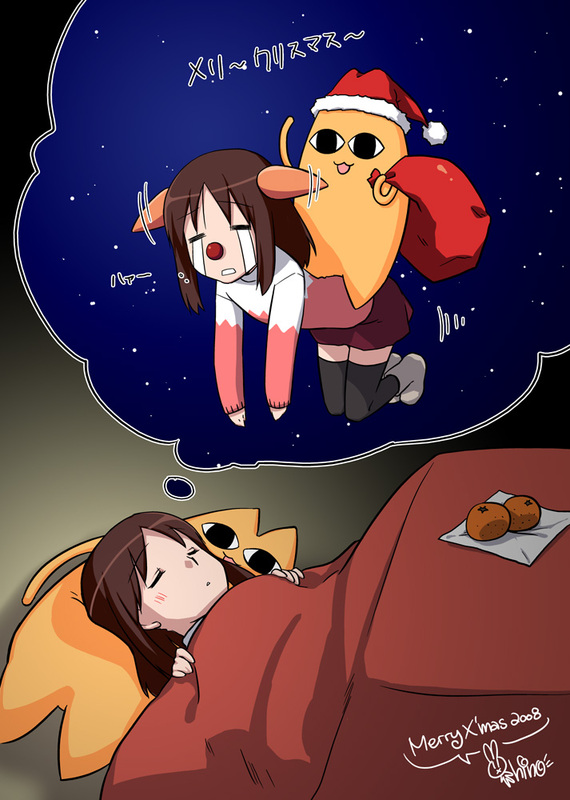 If Christ represents the innocent lamb, than Azumanga Daioh is an appropriate series to watch around December. It’s wonderful to see a Christmas episode that contains no fanservice and is purely innocent. Plus, Chiyo’s father as Santa is classic and Osaka’s musings on Rudolph and evil Santa will have you in stitches. Unseasonably warm – you might want to get out and enjoy some holiday music, if you can find, say, a nice band made of high school girls. I had trouble putting into words how I felt about Town of Evening Calm Country of Cherry Blossoms. I was originally intending to write about my top favorite shows from the passing decade but as I was listing down those that I have seen I realized that there are still plenty of shows that I haven t watched completely and there are also some shows that I might like but still haven t seen. Reindeer are real!? …Joking, joking. I’ve been meaning to break into Azumanga for awhile and haven’t gotten around to it yet. It’s spectacularly cute. The omnibus edition of the entire manga it out now, too. Certainly a cute episode about Christmas. Rewatching it cheered me up for the coming holidays. One would have to be in quite a funk to not get cheered up by Chiyo, Osaka, and the rest.